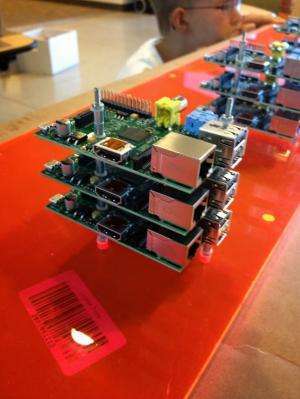 Researchers at the San Diego Supercomputer Center (SDSC) at the University of California, San Diego, have built a Linux cluster using 16 Raspberry Pi computers as part of a program to teach children and adults the basics of parallel computing using a simple model that demonstrates how computers leverage their capacity when working together. The system, named Meteor to complement Comet – a new supercomputer to be deployed in early 2015 as the result of a recent $12 million grant from the National Science Foundation (NSF) – will be demonstrated at SC13, the annual conference for high-performance computing to be held November 18-22 in Denver, Colorado. SDSC staff will hold a friendly gaming competition using Meteor, which will be connected to a large tiled display wall of LCD panels during the show's exhibit hours in the SDSC display space (booth #3313). "The goal of Meteor is to educate kids and adults about parallel computing by providing an easy-to understand, tangible model of how computers can work together," said Rick Wagner, SDSC's manager for high-performance computing (HPC). "One way we achieve this is by using Meteor as a presentation tool for demonstrations, with all of its components laid out in front of the audience. More importantly, we present Meteor in a fun, informal learning environment where students can try their hands at gaming competition while learning about the benefits of parallel programming." "Like Comet, Meteor is all about high-performance computing for the 99 percent," said SDSC Director Michael Norman. "It's about increasing computing access on a broad scale to support data-enabled science and engineering across education as well as research." One of SDSC's key areas of expertise is designing and configuring computers to work in concert; and as data networks become faster, multi-core processors become the norm, and accelerators such as GPUs (graphic processing units) become more prevalent, the skills required to make these elements work synchronously are critical to advancing scientific research and discovery. "Currently, the majority of computer science degree curriculums contain relatively few courses in parallel programming and distributed architecture at the undergraduate level and below, but the basic concepts aren't difficult," said Wagner. "Meteor and its Raspberry Pis provide us with a platform to develop methods that prepare middle- and high-school students to use and program current hardware." Wagner has already started developing a course curriculum, in addition to presenting a workshop at XSEDE13. He has worked with several high-school students as part of SDSC's education program, and with UC San Diego undergraduates on projects supported by Meteor, with students creating games that operate across the cluster. Beyond games, students also developed hybrid applications that used both the CPUs (central processing units) on the Raspberry Pis, in addition to the GPUs. With the start of the Fall 2013 term, Wagner, in collaboration with Brett Stalbaum, a UC San Diego researcher specializing in information theory, database, and software development, began teaching a visualization and computing course using Meteor to help visualize data generated by SDSC's HPC systems. "The potential teaching mechanisms are open-ended at this time, but could lead to such things as project-based learning or exploration with mentors," said Wagner. "In particular, the low cost of a Raspberry Pi means that each student can have dedicated access to their own small cluster for exploring. Meteor could then serve as a stage for students to present their work or test it on a larger scale. This kind of development and learning is what the Raspberry Pi is ideal for: taking a complex problem and allowing someone to solve it in a simple, unconstrained environment, as well as encouraging students to design new hardware that we haven't yet imagined." To view more images of Meteor and learn about some projects being done using the cluster, please visit Rick Wagner's photo gallery 1 and photo gallery 2. The Meteor project complements other educational programs at UC San Diego using Raspberry Pi computers. A free app called KA Lite can now deliver educational videos and exercises from the popular Khan Academy to anyone in any part of the world, thanks to the Foundation for Learning Equality, a group of UC San Diego undergraduates, graduate students and alumni, as well as others from around the globe who developed the software. "We are committed to enabling every person around the world, no matter their circumstances, to access a quality education through open educational resources and facilitating their use inside and outside of classrooms around the world," said Jamie Alexandre, the software architecture lead at the nonprofit and a cognitive science doctoral candidate at UC San Diego. Alexandre began tinkering with Raspberry Pis, a computer that can fit in one's hand and plug into a TV, to adapt the device into a server that can store Khan Academy materials for use offline. Fellow UC San Diego techies and enthusiasts joined the project, which led to KA Lite and ultimately to the Foundation for Learning Equality.